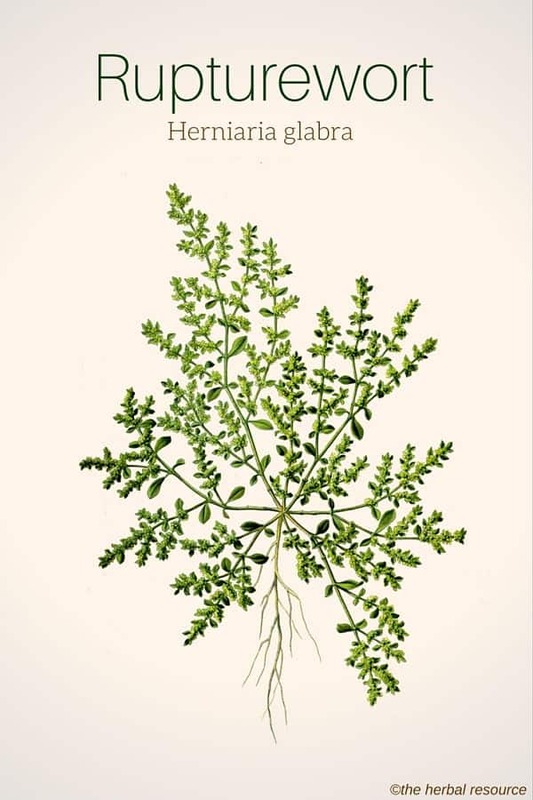 Other Common Names: Smooth rupturewort, glabrous rupturewort, herniary, green carpet, brudurt (Danish), herniaire (French), Bruchkraut (German), herniaria (Spanish). Habitat: The plant grows wild in Europe, West Asia, and North Africa. The plant grows well in dry sand and gravel and prefers open sunny places. Today rupturewort is a popular garden plant and used as ground cover for nutrient-poor soil. Description: There are around 15 to 20 species of annual or perennial plants that belong to the genus Herniaria. Most are found growing in abundance in Europe, Asia and Africa (especially in the Mediterranean area). Rupturewort is the only species that is cultivated. Rupturewort is usually a perennial, but may also be an annual. The short and hairy tap roots grow horizontally in all directions, thereby forming flat, circular mats that can be up to 30 cm in diameter and approx. 4 cm in height. 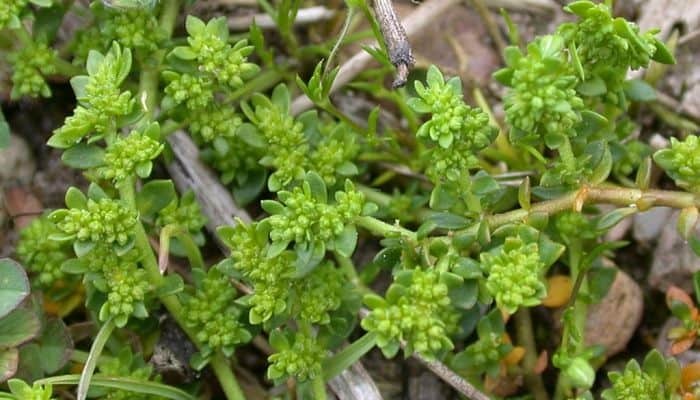 The small green and membranous leaves are elliptical or oval and grow opposite to each other on the stems. The flowers are tiny and sit in small clusters in the leaf axils. The sepals are green and blunt and the fruit is an achene that is found enclosed between the sepals. Plant Parts Used: The whole of the aerial part of the plant is used in herbal medicine. The flowering plant is collected and dried quickly in the shade at temperatures up to 40 ° C. The flowering time is in July to August which is also when the plant is growing fastest. Plants that are grown in sunny and warm places contain more of the active substances than plants grown in the shade. If the herb is stored for too long, or if it has not been dried in the right way, the active ingredients in the herb quickly break down. Therefore it is best to use the fresh herb or dried herb that has been stored (in sealed containers) for a short time. The herb has a slightly bitter taste. Rupturewort contains coumarins, flavonoids, phenolic acids, triterpenoid saponins, tannins and essential oil. The first mention of the plant as a medicinal herb is from the 1500’s and it was used for centuries as a diuretic agent in the treatment of chronic cystitis and urethritis. It was also used traditionally as a treatment for ailments of the upper respiratory tract, arthritis, rheumatism and as a “blood cleansing” agent. The genus name Herniaria comes from the Latin word “hernia” because it was believed that the herb could cure a hernia. This belief is also reflected in the English common name of the plant “rupturewort”. Most of the plant’s healing abilities are probably due the substances saponins and flavonoids. The herb does have diuretic and slightly astringent (contracting) properties and has a mild anticonvulsive and disinfectant effect on the urinary tract. 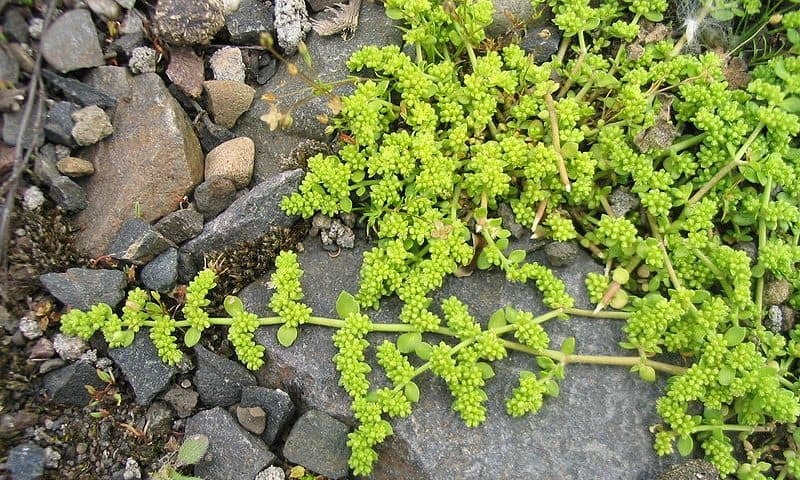 Rupturewort is still used by some herbalist to treat urinary symptoms such as cystitis, urethritis, and to prevent the formation of kidney stones and kidney gravel. The pharmacological effects and the potential therapeutic usefulness of the herb in the treatment of urinary tract disease have not yet been proven or documented by scientific studies. The herb is sometimes used as a poultice to accelerate healing of sores and wounds because of its astringent properties. The disadvantage of using the herb in herbal medicine is that it loses its medicinal effect when it is dried and should preferably only be used fresh. Additionally, the active ingredients found in the plant are quite volatile, so the herb should not be put in boiling water when it is used in herbal teas. This is the opposite of the herb bearberry (Arctostaphylos uva-ursi), which has a similar effect on the urinary tract but must be boiled for a certain time to release the active substance. Therefore these two herbs should not be mixed together in tea intended as a treatment for urinary tract disorders, although that is often done. To make a tea for diuretic purposes, one to two grams (one teaspoon) of the herb is added to hot water (not boiling) and allowed to steep for a while. The usual recommended intake is two to three cups a day. Some commercial products that can be found on the market today and are intended to treat urinary tract infections contain rupturewort. There have been no reports of adverse side effects or contraindications when the herb is used properly but it should only be prescribed by a qualified healthcare professional. Volák, Jan & Jiri Stodola: The Illustrated Book of Herbs. London, England. Caxton Editions 1998. I took this in a product called URTE PENSIL which is made in Denmark from a known herbs supplement supplier. It contains many other herbs. Its medicinal use is to combat flu/infections similar to antibiotics. It helped me to overcome my sickness, but I noticed that my bladder was like paralyzed. In short terms, I couldn’t hold my urination.